By Gerardo Granados: There has never been a better fighter than Roberto “Manos de Piedra” Duran; if you saw him fight you know what I mean. The way he fought was something to enjoy watching, great boxing technique and ring smarts, body attack, great defense, chin and power, he was not a big fighter in size but he was a giant inside the ring. Duran is considered as one of the best lightweights in boxing history. Duran might not be considered as the greatest boxer of all times but he did enough to be enshrined in to the IBHOF and the WBHF. Manos de piedra was fearless inside the ring and outside the ring he had a magnetic personality, he was for real he was not an illusion created by a greedy promoter. The way he looked and his arrogant macho attitude were genuine; I really miss that in the current organization champions. He engaged against hall of famers, he won and he lost to them but he was never afraid to fight against anyone. I remember this mean son of boxing and I miss him so much, now a day it is too hard to find a fighter who shares with him his bravery, his boxing style and even less his tough guy attitude. If any of his fans get to read this article they will be able to understand what am I talking about and for sure they will be able to describe him better than I can. For those young boxing fans that have no idea of who Roberto Duran was let me list some of his most notable’s opponents. On his seventeen pro bout defeated Ernesto Marcel former WBA World feather (before Marcel won the title) / W5(3)-D1* / in his last fight Marcel defeated Alexis Arguello by UD15 and then retired. Hiroshi Kobayashi former WBA World – WBC super feather / W6(1)-L1-D1*. IBHOF member Ken Buchanan former WBA World lightweight / W3-L2*. WBHF member Guts Ishimatsu former WBC lightweight / W5(3)-L4-D1*. Avenged his first defeat by KO11 against WBHF member Esteban de Jesus former WBC lightweight / W4(3)-L4*. Saoul Mamby WBC light welter / W6(2)-L4*. IBHOF & WBHF member Carlos Palomino / W8(6)-L1*. Upset IBHOF & WBHF member Sugar Ray Leonard former WBC – WBA World welter, WBA World light middle, WBC middle, WBC – WBO super middle – WBC light heavy/ W10(8)-L2-D1*; by UD15 to win his second division world title, it was Leonard first loss. IBHOF & WBHF member Pipino Cuevas former WBA World welter / W12(11)-L1*. Davey Moore former WBA World light middle / W4(4)-L2*. At thirty seven years old defeated three division champion Iran Barkley former WBC middle – IBF super middle – WBA World light heavy / W3(2)-L6* / Ring Magazine 1989 fight of the year award. Barkley defeated Thomas Hearns twice in title bouts. At forty six years old Duran avenges defeat by UD10 Jorge Fernando Castro former WBA World middle / W5(3)-L4*. At forty nine years old Duran defeats Patrick Goossen former IBO super middle / W1*. His first loss was against Esteban de Jesus former WBC lightweight / W4(3)-L4*. 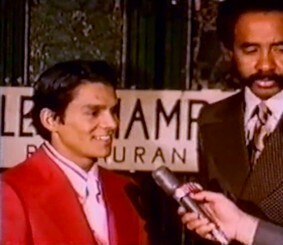 The “No Mas” bout, Duran refuses to continue fighting lost to IBHOF & WBHF member Sugar Ray Leonard former WBC – WBA World welter, WBA World light middle, WBC middle, WBC – WBO super middle – WBC light heavy/ W10(8)-L2-D1*. IBHOF & WBHF member Wilfred Benitez former WBC light middle & welter – WBA World light welter / W8(2)-L2*. IBHOF & WBHF member Marvin Hagler former WBC middle / W13(12)-L1-D1* / lost by UD15 in a close combat, Duran was able to battle Hagler and was not knocked as other twelve were. Was knocked out in just two rounds by future hall of fame member Thomas Hearns former WBA World welter & light heavy – WBC light middle, middle & light heavy – WBO super middle and IBO cruiser / W16 (10)-L5-D1*. In 1989 lost to Sugar Ray Leonard by UD12, failing to conquer his fifth division world title the WBC super middle. Forty three and forty four years old Duran lost to Vinny Pazienza former IBF lightweight – WBA World light middle – IBO super middle / W3(2)-L6*. Forty four years old Duran lost to Hector Camacho former WBO light welter – WBC lightweight & feather / W9(2)-L4*. Forty five years old Duran lost to Jorge Fernando Castro former WBA World middle / W5(3)-L4*. Forty seven years old Duran lost to William Joppy former WBA World middle / W11(7)-L5*. Fifty years old Duran lost to Hector Camacho in his last bout. Professional boxing doesn’t need the Pacquiao vs. Mayweather fight, what boxing needs is fighters willing to take a risk, boxers who are willing to prove to be the best against the best and not against tailor made opponents. No more catch weights fights that only make fans argue if the fighter was too weight drained to compete, no more greedy promoters who manufacture organization champions, no more greedy boxers who promote their own fights, no more excuses and no more title fights that are not worth to watch. Boxing needs fighters as Roberto Duran, Julio Cesar Chavez, Archie Moore, Thomas Hearns, Jake LaMotta, Carlos Monzon, Jorge Arce, Vinny Pazienza, Hector Camacho, Naseem Hamed, Mike Tyson or Arturo Gatti. Perhaps boxing purist wont agree but Boxing must be exciting to watch, it has to be fun because boxing fans pay to see a good fight between two skilled fighters trading punches, boxing must be violent and on times brutal, yes it is a sweet science but the ones who make boxing great always proved to have a heart bigger than his chest. Do you believe Roberto Duran would have avoided Juan Manuel Marquez, Amir Khan, Manny Pacquiao, Floyd Mayweather, Miguel Angel Cotto or Sergio Martinez? Duran would have beat most of them for sure.